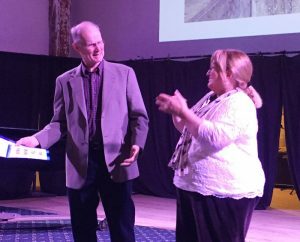 The Feeder Canal Alliance — still building upon Gaynelle and Charles Moore’s visionary reuse of an overgrown, overlooked ancient asset — marked its 30th anniversary on Wednesday, Nov. 7, at the Strand Theater in Hudson Falls, preceded by a social hour next-door at Maxwell’s Pub. The Alliance stunned its long-time president Howard Raymond with announcement during the annual meeting that the classrooms that he first envisioned at the preserved, former coal silos at the rear of the Griffin’s Lumber property will be named the Howard Raymond Field School. “I don’t deserve it,” said the visibly moved Mr. Raymond. “It’s a grass roots board. It’s a team board,” propelled by volunteers. Howard Raymond was caught by surprise — his knees actually buckled — when executive director Jeanne Williams announced at the Alliance’s 30th anniversary annual meeting that the classrooms in the former coal silos at Griffin Lumber will be named the Howard Raymond Field School. As the Moores suggested and pursued in the 1980s, the Feeder Canal and towpath have given rise to a seven-mile long linear park popular with hikers, bikers, walkers, canoeist, kayakers and historians. Dan attended the celebration, which also featured Betty Raymond’s raspberry-filled cake. “It’s the best cake you’re ever have,” her husband Howard declared. Mr. Raymond praised Jeanne Williams, who has been the Alliance’s executive director for 12 years. “Jeanne does everything from clean toilets to get $100,000 grants. She is one of a kind. She keeps us on track,” Mr. Raymond said. 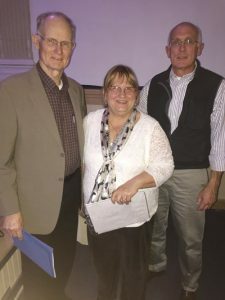 He thanked the Village of Hudson Falls, towns of Queensbury and Kingsbury, the state Thruway Authority, which oversees the canal system, and several core supporters who have passed away, including Bob Chesterman, By Lapham, Ted Young, Myron Watkins and Patricia Crayford. Mention was made that the Feeder Canal — which dates to the 1830s — is the oldest canal in New York State still serving its original purpose — feeding water from the Hudson River in Glens Falls to the Champlain Canal in Kingsbury-Fort Edward. But in the late 1980s, Gaynelle and Charlie Moore saw additional possibilities for the canal itself and revival of the path that formerly ran alongside it. Ms. Moore, who lives now in a retirement community in Rhode Island, and her late husband Charles won support from the Thruway Authority. “Gaynelle was a thorn in their side,” Mr. Raymond admitted. From left: Howard Raymond, the Feeder Canal Alliance’s president for 28 years; Jeanne Williams, executive director for 12 years, “who does everything from clean toilets to get $100,000 grants”; and Chris Reed, board vice-president for “more than 25 years.” He wasn’t quite sure how many off the top of his head. Now, as the Moores envisioned, the Feeder Canal linear park is a place of “industry, recreation and history and all of that,” Mr. Raymond said. He says they’re following the park master plan and credited “the folks that put it together. As part of the Empire Trail, this year the state granted $1.2-million to link the Feeder Canal to the Champlain Canal Trail via “two bridges and a pedestrian bicycle tunnel under Route 196 to continue the CCT trail to Fort Ann,” Mr. Raymond said. Meanwhile on the Glens Falls part of the Feeder Canal to the east, Alliance members said a goal is to work on the former lime kilns on Shermantown Road off Warren Street. “Lots of things make Glens Falls special and there is one thing that makes it unique and it’s the Feeder Canal,” said John Anthime Miller. 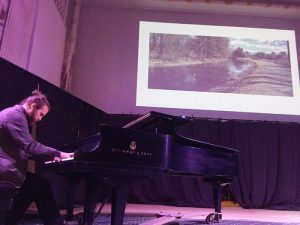 Then the Glens Falls musician-composer who grew up near the canal, played part of “Feeder Canal: A Song Cycle,” his composition inspired by the canal. 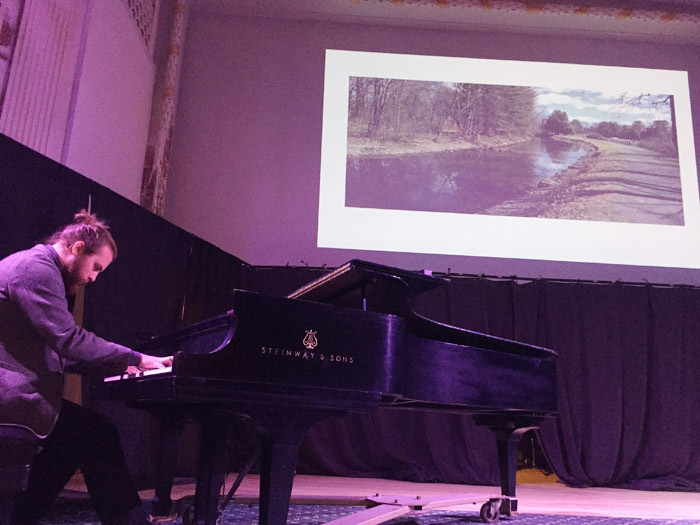 As he played the “first movement of what will ultimately be a much longer piece,” images of the canal were projected onto the screen behind him. He calls the canal “my favorite place on the planet.” Chronicle photos/Mark Frost. At the 30th anniversary celebration, the Alliance also unveiled its Thirty for Thirty Plan seeks to raise $30,000 as an ongoing fund where the Alliance must match funds to obtain a grant. They’re seeking minimum $1,000 grants to get the Thirty for Thirty Plan launched. The Alliance office is at 21 Thomson Avenue, Glens Falls. Phone: 518-792-5363. E-mail: info@feedercanal.org. Web: www.feedercanal.org.